Former Korean Air executive Heather Cho, who delayed a plane over how nuts were served, has been arrested. TV footage showed Heather Cho, also known as Cho Hyun-ah, being led away, shortly after a court in South Korea granted a warrant for her arrest. Heather Cho, the daughter of Korean Air’s CEO, is being charged with violating aviation safety law and impeding crew in their duties. She ordered the plane to turn back on the runway in New York after nuts were served in a bag, not on a plate. She has denied physically assaulting the chief steward, Park Chang-jin, who says she made him kneel and beg for forgiveness before jabbing him with a document folder. Heather Cho has already apologized and resigned as head of the airline’s flight service. TV images on December 30 showed the 40-year-old Heather Cho being taken away by prosecutors, with her head bowed. Another airline executive has also been arrested, accused of destroying evidence relating to the case. South Korea’s transport ministry said this month that it would take disciplinary measures against the airline in the wake of the incident. Korean Air could face either a partial flight ban or a fine, the ministry said. A government investigation found that Heather Cho screamed and shouted abuse at a flight attendant after he served her macadamia nuts in a bag. She then ordered the plane to go back to the terminal at New York’s JFK airport to offload the attendant, who was fired on the spot before the plane proceeded on its journey. He has since been reinstated. The incident forced the flight to Seoul to be delayed. 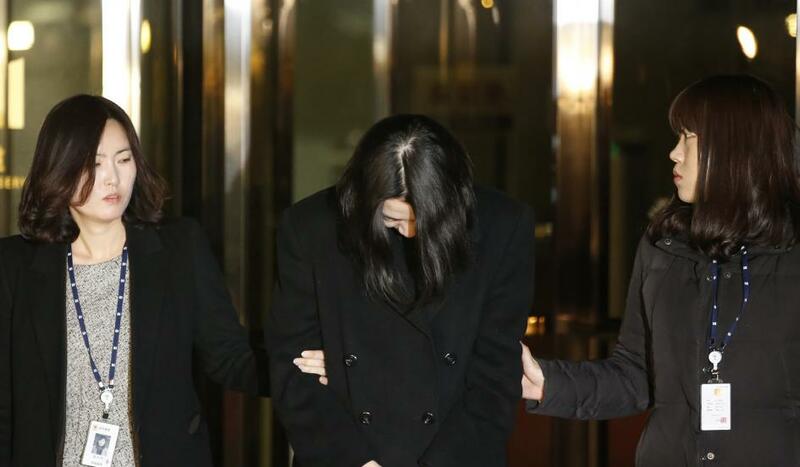 Her father, Korean Air chairman Cho Yang-Ho, has apologized for his daughter’s “foolish act”. Cho Yang-ho also said his daughter would step down from all her posts in companies under the Cho family-owned Hanjin Group, which also owns Korean Air.